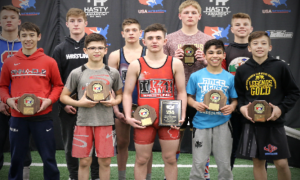 The United States Greco-Roman Seniors capped a busy March with two more medals yesterday at the Hungarian Grand Prix in Szombathely, Hungary. That makes the monthly total 10 with three golds, one silver, and six bronze. 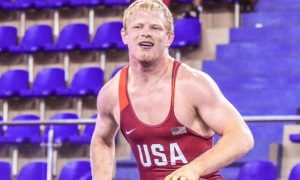 If you’d like to go back just a little further to the start of the year, that number climbs to 12, as Hayden Zillmer (98 kg, Minnesota Storm, world no. 19) and Daniel Miller (98 kg, Marines) both medaled at overseas events in January. 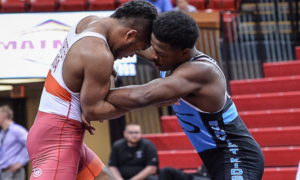 The United States Greco-Roman Seniors who went overseas in March amassed a cumulative record of 57 wins and 39 losses to go along with those ten medals. 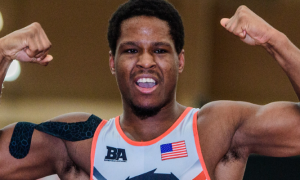 It is also worth mentioning that two athletes, Ellis Coleman (66 kg, Army/WCAP) and Patrick Martinez (80 kg, NYAC), were both undefeated at Thor Masters before being forced to withdraw due to injury. Coleman was 4-0 on the day and headed towards a medal (if not a championship) and Martinez left with a 2-0 ledger. Geordan Speiller (Florida Jets, world no. 18) was impressive throughout the morning yesterday as he marched through the 80 kilogram bracket before falling in the finals to 2014 World Champion Peter Bacsi (HUN, world no. 5 at 75 kg) 4-0. Speiller actually defeated Bacsi last year at the same tournament via a decisive 8-2 score, giving the Floridian one of those “signature wins” that people take notice of. The final yesterday afternoon was intense and high-paced but yet, bereft of many scoring opportunities. Bacsi hit an arm throw in the first period for four points and that was a wrap. No passivity points, no real dodgy calls. During the last minute, minute and a half of the second period, Speiler really left it all out there. He came at Bacsi hard and from every direction trying to initiate some kind of opening. It obviously didn’t happen, but Speiller’s overall performance was something to behold. Speiller won four matches Sunday but the one that stands out the most was against Pavel Pominchuk (BLR, world no. 16). Darting angles, pivoting into and out of tie-ups, changing levels — Speiller brought forth all of the tools that make him such a uniquely talented athlete. In the early stages of the bout he zoomed in on Pominchuk off of a duck and got really deep on a bodylock to the point there was zero recourse available for the Belarusian. Against a lesser foe, that kind of position is at the very least a four-point throw, if not a whole five. Pominchuk, as agile as he is, managed to collapse his weight down enough to prevent a complete mauling and instead, landed belly down, giving Speiller just two for the correct throw. But the tone was set, just the same. Speiller wound up running circles around Pominchuk en-route to a 7-0 dusting. There were two other major adrenaline-pumping moments on Day 2 and both came from Marines. Miller locked down his second international bronze of the year with a dramatic four-point high-dive versus Felix Radinger (GER) with around :40 left in the match. Miller had wrestled tough all day, coming away with a big pin over Revaz Nadareshvili (GEO) and a crisp, business-like tech in the bout before that against Fodor Tamas (HUN). Miller’s lone loss came in the semifinals to eventual silver Javid Hamzatau (BLR, world no. 3), who took third in the World a few years ago and made the podium at 85 kilos in Rio. Miller’s comeback against Radinger is one that will likely be remembered for quite a while. Miller led 2-1 in the first before Radinger caught him with a near-textbook lateral for four. The score was 5-3 in the second period and though additional Miller points weren’t out of the question, they naturally began to seem less and less likely as time started to become an issue. Then all of the sudden, there it was Miller. From almost the center of the mat, Miller bulled his way in with a high-dive and drove Radinger to his back at the edge for four. Just huge. Miller would wind up netting another point from a step-out shortly after to make the final score 8-5 in his favor. Let’s not forget John Stefanowicz (80 kg, Marines), who nearly pulled off a gigantic upset and the best part about it? If he did, it wouldn’t have looked like a fluke. Stefanowicz was all over 2016 European Championships gold medalist and Rio Olympian Zurabi Datunashvili (GEO, world no. 8) in their bronze medal match, earning the first passivity point fairly early on. Datunashvili scored two on an arm throw and then later nabbed another two when Stefanowicz missed on his own try at the maneuver. Down 4-1 with time running out, Stefanowicz once again looked to give the arm throw another chance, only to let it go, spin around, and rush at Datunashvili, who by now had no choice but to wilt under the pressure. Stefanowicz then seemed to toss Datunashvili down off the edge for what could have been four points. No points were awarded, however, resulting in a challenge by the US. Following the review, two went Stefanowicz’s way instead of four, giving Datunashvili the edge in criteria thanks to his offensive points. A tough loss? Probably. Maybe. Likely. 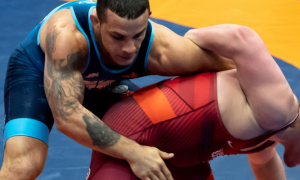 But at the end of the day, John Stefanowicz was just in a medal match at the Hungarian Grand Prix where he pushed one of the better guys in the world to the limit. Perhaps the most interesting aspect to all of this will be to see how this performance affects Stefanowicz’s confidence moving forward. He has enough capital at this juncture to be considered a national-caliber contender and he’s made steady improvements, particularly in transitions. Stefanowicz could compete at the World Team Trials at either 75 or 80 kilograms and you’d have to think whichever bracket he appears in, he’ll be an undercover threat to make the National Team. They are keeping the mats down at the Arena Savaria in Szombathely this week in anticipation of the 2017 U23 European Championships. The third annual event, which acts as a great showcase for the continent’s younger Senior competitors, offers a load of talent to feast your eyes on. Olympic medalists, Junior World champs, up-and-coming Seniors…there is a lot to look forward to. Two Rio bronze winners will be giving it a whirl — Shmagi Bolkvadze (66 kg, GEO, world no. 4) and Denis Kudla (85 kg, GER, world no. 3). Kudla won this event a couple of years ago. 2014 Junior World champ Bolkvadze announced his presence in full by taking bronze at the “regular” European Championships last year ahead of his run to the podium in Rio. 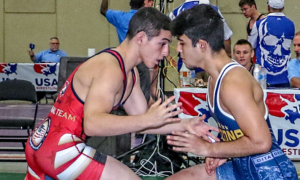 Greco-Roman competition begins Saturday morning in Hungary with 59, 71, 80, and 98 kilograms. The tournament concludes Sunday with 66, 75, 85, and 130 kilograms. Live coverage in the US can be found on Trackwrestling.com. The “Five Point Move Podcast” will be premiering soon with hosts Tim from 5PM and 1996 Olympic silver medalist Dennis Hall. We said this was one of our plans and here it is. The format will be, in essence, quite simple — Greco-Roman wrestling in the United States of America. Of course, other topics will likely wind up becoming part of the fabric and guests can also be expected to show up (often). The goal for this new endeavor is to keep Greco-Roman in the conversation as much as possible while illuminating other aspects of wrestling which play a role in the general perception of the style. And as always, more exposure for the talented and dedicated American athletes who make this sport as wonderful as it is. New podcast episodes should be available every week on iTunes and elsewhere. You’ll be notified accordingly. Why is Greco getting the shaft in May? We’ll be trying to find out. 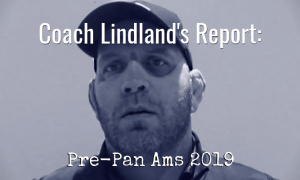 A new “Coach Lindland’s Report.” Lindland was in Portland (Oregon) over the weekend and with the Grand Prix going on in Hungary, it made scheduling difficult. News on an athlete making a comeback. A fresh interview with a name worth talking about.